This article is about the tool. For the secret society, see Tong (organization). Tongs in which the pivot or joint is placed close to the gripping ends are used to handle hard and heavy objects. 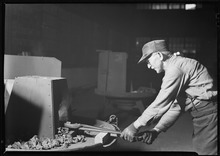 Driller's round tongs, blacksmith's tongs or crucible tongs are of this type. Design variations include resting points so that the working end of the tongs does not come into contact with a bench surface. A myth contained in the classical Jewish text Pirkei Avot states that the first pair of tongs were created by God right before God rested on the Seventh Day. The reasoning is that a blacksmith must use a pair of tongs in order to fashion a new pair of tongs. Accordingly, God must have provided humankind with the first pair of tongs. ^ Scherman, Nosson. Ethics of the Fathers Annotations. The Complete ArtScroll Siddur. Brooklyn, NY: Mesorah Publications, 1984. 544-586.